07 Jul, 2017 by	Margaret M.
With Trump having been in Europe for the past few days both giving speeches in Poland and having meetings with other world leaders in Germany, the press had to start finding ways to attack him without attacking his pro-America message, so they went for the easiest route possible: go after his wife, Melania. 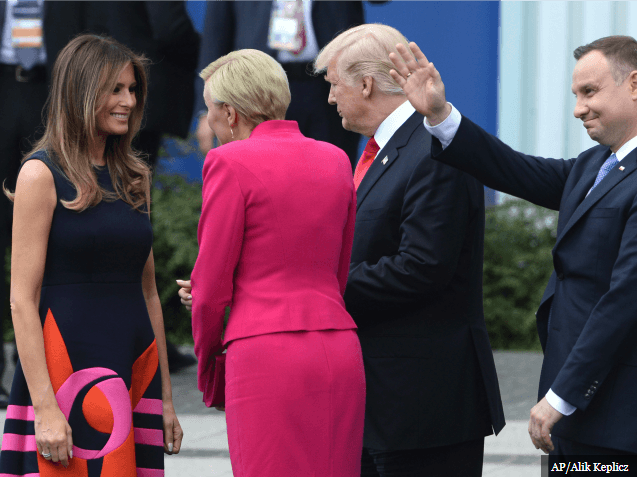 The video in question, posted below, is a deceptively edited 4-second piece of work that appeared to show the Polish First Lady snubbing Donald and moving straight to his wife. But, because we here at Right Wing News are dedicated to not bringing you fake news, we would like to show you the full video of what happened, clearly showing that the Polish First Lady simply chose to shake Melania’s hand first, then moved on to Donald. Meanwhile, the fake shake was reported by the idiots at outlets such as the Huffington Post, Newsweek and Time Magazine. Russian hacking didn’t work, Comey didn’t work, two scoops didn’t work and an edited video of a handshaking order certainly won’t work. The left is insane and will keep getting worse.